Ela is also a member of the Handel Group Life Coaching Teleseries “Life Coaching for Yoga Practioners,” where she is learning to stand in the present with her truth and dream at the same time. Ela’s goal is to own an adaptive yoga studio called Sacred Common Ground Yoga. Ela believes in the power of Yoga. Yoga is art. Yoga is life. Through her journey of self-discovery and transformation, Ela is learning that she does not have a disability, just different ABILITIIES. 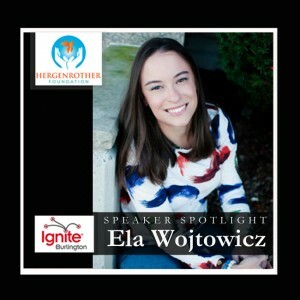 This entry was posted in Ignite Speaker and tagged cultivating perseverance, ela wojtowicz, ela wojtowicz at wanderlust, ela yoga, ignite burlington, ignite burlington 2013, ignite vermont, off the mat into the world, seane corn, wanderlust, wanderlust vt on September 19, 2013 by Hallie.